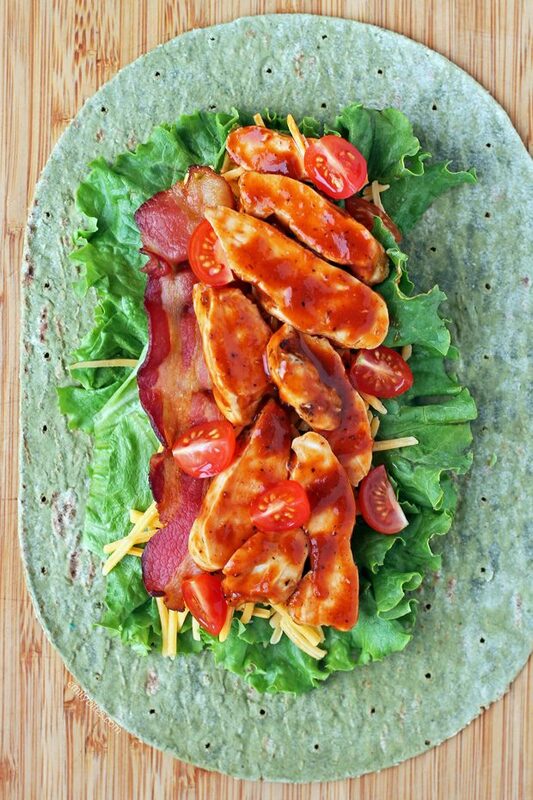 I have partnered with Flatout to create these Barbecue Chicken Bacon Wraps. I have been compensated for my time commitment to work with their product, however my opinions are entirely my own and I have not been paid to publish positive comments. I’m also thinking about new lunch ideas and lately these Barbecue Chicken Bacon Wraps have been always on my mind! These wraps are a great way to use up leftover chicken or rotisserie breast meat and they’re super easy to make. Perfect for weekday lunches! Smoky, crispy bacon, juicy tomatoes, sweet barbecue chicken, sharp cheddar cheese and all wrapped up in my favorite Flatout flatbreads – it’s perfection! 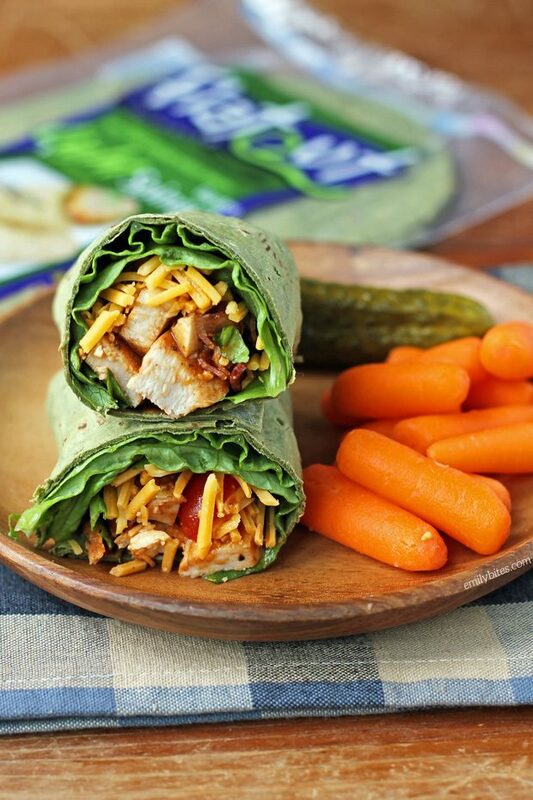 Each of these wraps is filling, satisfying and only 322 calories or 6 Weight Watchers SmartPoints. As many of you know, I love me some Flatout flatbreads. I use the Light Original variety a lot but for this one I love the Light Garden Spinach flavor. If you can’t find that one, don’t worry! It’s just as tasty on the Light Original. Plus, they’re both tasty, versatile, full of protein and fiber and now endorsed by Weight Watchers®, so what’s not to love? I always have some in my pantry because they make quick and easy pizzas, wraps, quesadillas, pinwheels, sandwiches and more. Perfect for planning to use in a healthy recipe or for dinner on the fly with whatever is in your fridge. Don’t forget to check out my Easy Slow Cooker Shredded Chicken post- the perfect way to make shredded chicken for this recipe! Looking for more recipe ideas using Flatout flatbreads? Check out my Taco Flatbreads, Easy Chicken Quesadillas, Buffalo Chicken Tacos, Greek Chicken Tacos, BLT Flatbreads, Savory Sausage Pumpkin Flatbreads, Chicken Caesar Wraps, Veggie Lover’s Flatbread, Black and Blue Steak Wraps, Easy Taco Cups, Spicy Southwest Chicken Wraps, Peaches and Cream Dessert Flats, Three Cheese Mushroom Flatbreads, Maple Bacon Breakfast Wraps, Chicken Saltimbocca Sandwiches, Buffalo Chicken Pinwheel Wraps, Spinach Artichoke Flatbreads, Greek Snack Flats, Mexi Burgers with Guacamole, Chinese Chicken Wrap, Chicken Pesto Flatbreads and Bacon Cheeseburger Wraps! In a bowl, toss the chopped or sliced chicken with two tablespoons of the barbecue sauce until coated. This looks so good! I’m hooked on wraps lately and can’t wait to try this one.